There are many petroglyphs located above the confluence of Rochester Creek and Muddy Creek. This is a closer look of the main and most famous panel at the site. 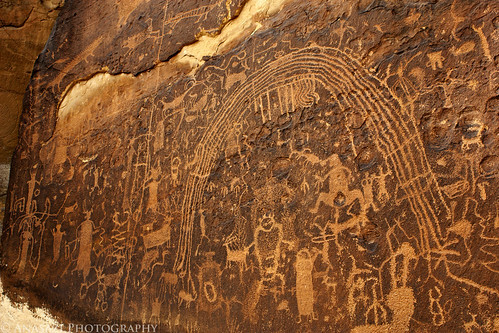 It contains Barrier Canyon Style elements, Fremont petroglyphs and probably some later Ute figures, too. There are also some very unusual creatures found in this panel that no one can seem to agree on who carved them! I have visited this panel a couple of times and I always notice something new on each visit.